A few days ago I went to Salveo Gym in Sundbyberg. _MAL0567, originally uploaded by Michael A. Lowry. Anna F. and I did some bouldering upstairs. There is a good mix of problems, and many of them are quite challenging. _MAL0599, originally uploaded by Michael A. Lowry. 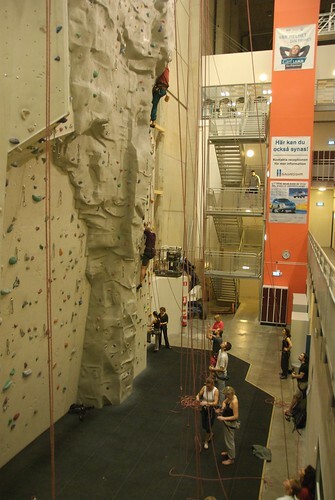 After an hour or so of bouldering, we strapped on our harnesses and walked downstairs to the bottom of the the twenty-six-meter wall — the tallest indoor climbing wall in Scandinavia. _MAL0620, originally uploaded by Michael A. Lowry. 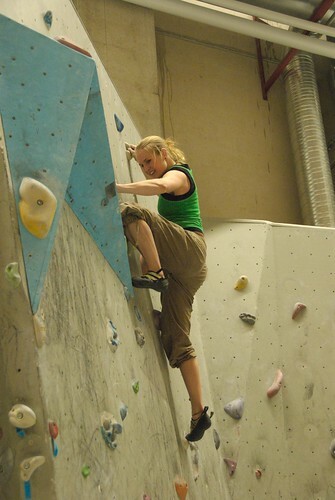 Here's Anna climbing a 5c-rated route up the tall wall. I managed to make it to the top in one go. _MAL0490, originally uploaded by Michael A. Lowry. Salveo is a big place with lots of amenities, and it's very shiny and new. 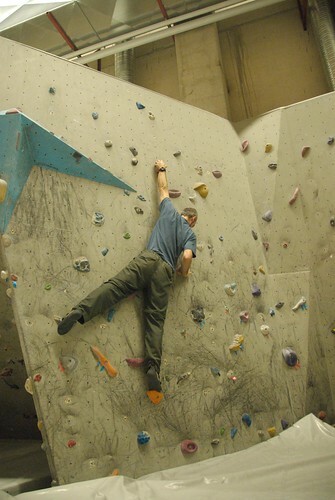 I still prefer the climbing — and particularly the bouldering — at Klättercentret. KC is cozy and the folks there feel like a family. 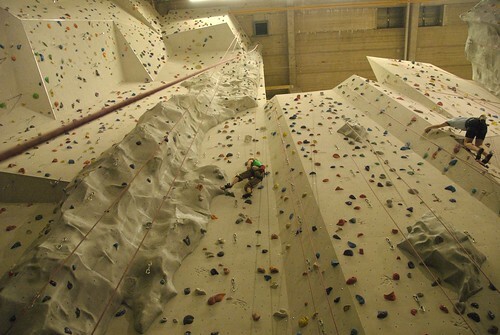 Even so, I do like Salveo and I'm sure I'll climb there again. Thanks to driver software developed by Colin Munro of Mice Software, I now have my Xbox 360 wireless controller working with my Mac. I tried out Jammin' Racer and it seems to work okay, even though the controls are a bit too sensitive. Halo 1.5 is supposed to support gamepads, and indeed the Wireless Xbox360 controller appears in the list of gamepads in the game's settings screen. However, I have not yet figured out how to activate the controller in this game. If I click on it, it moves to the left as though it were active, but when I exit to the settings screen and return to the gamepads screen, it is inactive again. Oh well, I never really liked playing Halo with a gamepad anyway. MAME on the other hand would be a lot of fun to play with the controller. I think it would be fun to play old arcade games with the analog stick on the controller. Certain games would be better suited to being played this way than others. Some games that come to mind are Star Wars, Paperboy, Centipede, Starblade, Ikari Warriors, and Heavy Barrel. Top-scrolling shoot-'em-ups like Sky Shark and Raiden would probably also work. MacMAME supposedly supports gamepads, but this program is not Intel-native and the project has been more or less dormant since Apple switched to Intel. MAME OS X is a promising replacement, but as far as I can tell, it does not yet support the use of gamepads. Maybe this capability will be added in a future release. It's nice finally to be able to use my birthday gift from three months ago! Thanks again, Kelly! _MAL0001, originally uploaded by Michael A. Lowry. I had a great long weekend of skiing at Kittelfjäll. Aside from the minor bus accident on the way home, the trip was just pefect. Joining me on the trip were Lotta, Matt & Lisa. 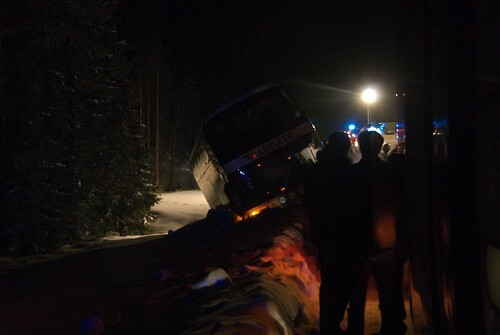 We took a sleeper bus up on Thursday night, arriving early Friday morning at Kittelfjäll. We changed into our ski clothes and hit the slopes around 11. That first day was quite cold and overcast, so we made a couple of trips to the warming hut to sit by the fire and sip hot cocoa. In the evening after the lifts closed, Matt & Lisa and I walked about a mile down th road to the “Handlar'n” grocery store, where we bought food for two dinners. After a quick sauna, we had a dinner of pasta with meat sauce and crashed for the night. Saturday was a bit warmer and brighter. We were also well rested, so we all felt more confident on the slopes. Kittelfjäll had had record amounts of snowfall in recent weeks, so we could not have asked for better snow conditions. Most of the terrain at Kittelfjäll is unprepared, so we spent much of our time blazing our own trails through the trees on untouched powder — really fun, but also quite exhausting. Saturday afternoon after the lifts closed, I sat for a while in the hotel sauna. 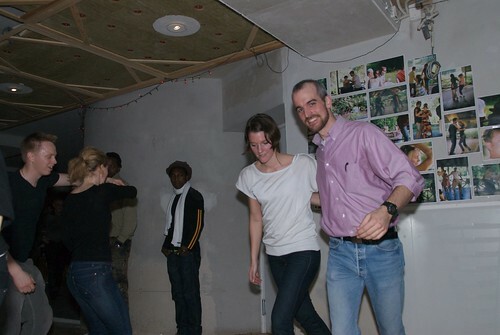 There, I met Stina and Johan, two friendly folks whom I learned are fellow Lindy-hop dancers. Sometimes it really is a small world! Dinner on Saturday was roasted chicken with Basmati rice. After dinner, Matt and I went to the bar at Kittelparken, where we chatted with the owners, who also run a heli-skiing operation during the day. A woman whose name is Ulla (I think!) played guitar and sang. Sunday was even better than Saturday. The temperature had risen to just six or eight degrees below freezing, and the sun shone all day long. We spent much of the mornning skiing the far Eastern side of the mountain, accessible from the top of the Jan Express lift. No one else was skiing over there, so we had the area to ourselves. The top of the slope was a wide-open expanse of gently sloping terrain with sparse scrubby birch trees. But lower down the terrain plunged into a couple of powder-filled ravines, each lined with an assortment of birch and pine. The ravines were like half-pipes in a way — lots of fun, and thanks to the powder, forgiving of mistakes. After an exhausting morning, we cruised down to the bottom of the mountain and had a bite of lunch at the bar at Kittelparken. There, we ran into Micke, the heli-skiing guide we had met the night before. On a whim, Matt and I decided to go heli-skiing after lunch. We went first to the top of a peak on the Southwest side of the valley, essentially opposite the valley from Kittelfäll. (I don't remember the name of the peak, so if you know it, please remind me! ) The top was a bit steep and somewhat icy in places, but once we got lower down the snow was a bit softer. Or to be clear, there was more wind-blown powder on top of the harder stuff beneath. It took a while to learn to read the snow conditions quickly. I tried to turn on patches of powder rather than the icy patches but it wasn't always easy to tell one from the other. What seemed at first to be soft often turned out to be hard and slick. There was a lot of hardened wind-blown snow up there too, making some bits quite bumpy. Lower down it was just powder galore, and lots of trees. My thighs were burning by the time we skiied onto the frozen lakebed for our rendezvous with the helicopter. To conclude our heli-skiing adventure, we flew up to the top of the saddle above the area we had skiied in the morning. We then just skied down until we reached the part of the ski area accessible from the lifts. Heli-skiing is a lot of fun, and I'm glad I tried it. I'd recommend it only to stronger skiers though, mostly because of the wide variety of terrain and snow conditions one is likely to encounter. After we had paid our heli-skiing bill, Matt and I headed back over to the other side of the mountain again, where we quickly hooked up with Lotta & Lisa. Kittelfjäll is a relatively small place, so if you get separated from your skiing buddies, you'll probably run into them again before you know it. I saw Lisa skiing down while Matt and I were on the lift on the way up. When we found them, Lotta and Lisa were sitting on the edge of a ridge, resting before their descent. The four of us did a few more runs together as a group, catching the last few runs and soaking in the last rays of the setting sun. Kittelfjäll is a blast. I can really recommend it to anyone who enjoys skiing on unprepared slopes. After another quick sauna, I joined the group for dinner; and a bit after that, we packed up the bus and hit the road, homeward bound and expecting to sleep the whole way to Stockholm. As you know from my previous entry, our evening was not destined to be that simple. But all's well that ends well. Be sure to take a look at all of my photos from Kittelfjäll. Labels: Johan W., kittelfjäll, skiing, Stina S.
This afternoon, I was going through old files on my Mac, when I stumbled across some photos I had almost forgotten, taken about eight years ago. Back then, I was a student at UT Austin, and I hung out with a lot of European exchange students (how do you think I ended up here in Stockholm?). 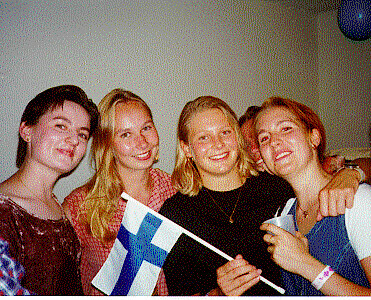 These two photos reminded me of a group of Finnish exchance students I knew back then. Mia, Kati, Hanna & Petra, originally uploaded by Michael A. Lowry. These lovely girls are Mia, Kati, Hanna & Petra from Finland. 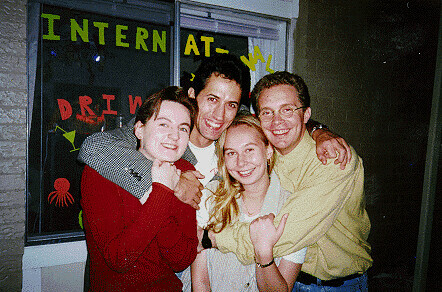 I met them way back in the autumn of 1998, at the “International Drink Fest,” a party arranged by the European Students Association of the University of Texas, in Austin, Texas. Mia, Argos, Kati & Marco, originally uploaded by Michael A. Lowry. Here is another photo with Mia, Argos Cue (a Spaniard), Kati, and Kati's then-boyfriend Marco. Given that I live in Sweden now, I thought it would be fun to get back in touch with these folks. I don't know if they live in Finland, or what they are doing. And unortunately, I don't even know their last names. If you know any of these people, please let me know, or put them in touch with me. Bild 059, originally uploaded by Michael A. Lowry. Daniela's friend Katarina turned 22 yesterday and threw a big birthday party at the bar Snaps down on Medborgarplatsen. After dropping the cats off and having dinner with Sarah & Tomas, I took the commuter train down to Södra Station and walked to the bar. It was pretty cold out — I'd guess around -8 °C. Inside though, it was anything but cold. Katarina and about a hundred of her friends were talking, drinking, and dancing. Daniela introduced me to a few folks, and I took a few photos between dances. Katarina took this nice photo of Daniela and me with Daniela's camera. You can find more of her photos at Daniela's photo diary. A bit after midnight, we ran down to Slussen to catch the last subway home. _MAL9515, originally uploaded by Michael A. Lowry. Sarah & Tomas agreed to cat-sit for me over the weekend while I'm away on a little ski trip to Kittelfjäll. So last night, I went over to their place for dinner and brought the cats with me. Tomas fixed an excellent pasta dish, and we washed it down with a bottle of French Côtes du Rhone wine. _MAL9517, originally uploaded by Michael A. Lowry. Alex and Sasha spent the time exploring their new surroundings. For the first hour, Alex meowed almost constantly. Eventually though, he calmed down. 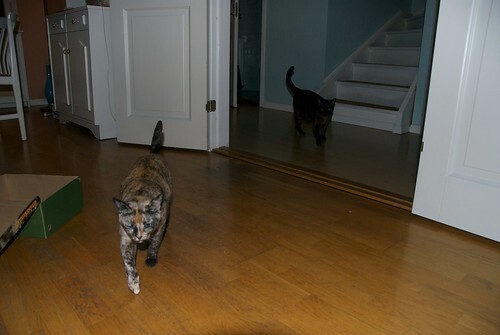 By the time I left, both cats were calm; but they still tried to follow me out the door. Such sweeties. Sarah & Tomas are also sweeties for agreeing to take care of Alex & Sasha for me. Thanks you two! I installed Apple's Boot Camp beta software on my Mac Pro soon after it was released. This software allows one to run Microsoft Windows on an Intel-based Mac. The Boot Camp Assistant program lets one repartition an existing HFS+ volume, adding a FAT32 or NTFS partition to the disk without damaging the existing HFS+ partition. I used this software to repartition a 500 GB drive into two equally-sized partitions: one HFS+ partition, and one NTFS partition. I then installed Windows XP SP2 on the NTFS partition. Everything worked fine for a while. But then the Boot Camp volume stopped showing up in the Startup Disk pane of the System Preferences program. What this means is that Startup Disk was no longer seeing a bootable operating system on the NTFS Windows XP partition. I decided to remove the NTFS partition and add it back again. The Boot Camp Assistant program lets one do this. Unfortunately, things did not go smoothly. After I removed the NTFS partition and rebooted, I was shocked to see that the HFS+ partition had not ben expanded to fill the entire drive. I used Disk Utility to check the drive. The first time I did this, the program reported the abnormal end of a child process. The second time, the program was succesfully able to repair a minor problem with the volume bit map. However, the problem with the missing disk space remained. The following screenshot illustrates the problem. I am sure that reformatting the entire drive would fix the problem, but I would rather not take such a drastic step yet. I haved posted a new topic to Apple's Boot Camp discussion forum, asking for advice. I've been a busy little bee. Check out my other weblogs too see how I've been climbing, dancing, and partying. This is not the first time I have chosen to post a short summary here that links to updates I have made to my other blogs. This raises a topic that I've been meaning to discuss for a while now. Specifically, I am trying to decide whether there is any longer a need for me to maintain so many blogs. The original intent of starting multiple blogs was to separate posts by topic. This was necessitated by the fact that I often posted many photos in a single blog entry, and not all of my readers are interested in all of the topics on which I write. For example, a reader most interested in my nature photography might not wish to wade through three dozen climbing or dancing photos just to find the few nature photos that interest him. However, nowadays I don't usually post more than a couple of photos to my blog in a single entry. With the demise of BloggerBot at the beginning of this year, it became too time-consuming to post many photos at once to my blogs. I signed up for a pro account at flickr and have been posting my photos there ever since. I categorize the photos into different sets, and also and tag them based on date, place, and subject. The sets and tags mirror to a large degree the subdivision of my blogs: biking, climbing, dancing, partying, and so forth. When I have uploaded a new batch of photos to flickr, I usually create a new entry in the appropriate weblog, with a single photo and a link the the whole batch in flickr. On rare occasions I'll include more than one of the photos in the blog entry; but flickr's system does not make doing this very easy, so I usually just post one photo to the blog. To summarize: the photos already organized by topic on flickr; the original reason for creating multiple blogs (segregating large posts of photos by topic) is obviated by my new habit of posting only one or two photos per blog entry; and lastly, it's more trouble to check multiple blogs than to be able to find all updates in one place. Considering all this, I wonder whether my system of posting to blogs has outlived its usefulness. Should I post everything to a single blog? Should I continue my current practice of posting to each blog based on topic? Or should I strike a compromise, posting to each blog based on topic, but including the most interesting posts, and an occassional summary, here? Update 2007-02-23 – On the advice of my readers, I have begun to consolidate my posts on this blog. _MAL9144, originally uploaded by Michael A. Lowry. Coco from Lindy hop dancing (and the party on Friday) joined me for a skate on Edsviken, from Ulriksdal up to Sollentuna and back again. The idea was that we would meet Maria, Susanna & Johan on the ice and skate with them. But somehow we missed one another. So instead, we skated separately and then met up later at the cafe at Ulriksdals Slott. MS Wireless Gaming Receiver, originally uploaded by Michael A. Lowry. I had a meeting at Kista Entré this afternoon, and did a bit of shopping in Kista Galleria afterward. After having no luck at two shops devoted to video games, I found this little gem at On Off, a big electronics chain similar to Best Buy. 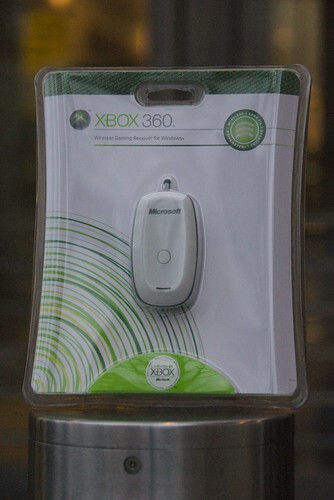 It's Microsoft's Xbox 360 Wireless Gaming Receiver for Windows. It allows one to use a wireless Xbox 360 controller with a PC. I'm planning to use it with the controller Kelly gave me as a birthday gift last year. Now I just need to wait until Mac OS X drivers for the device become available. In the U.S., the receiver can be found for as little as $16. I paid 250 SEK for mine, roughly equivalent to $36 — more than twice the price of the same thing in the U.S.
Oh well. At least I have it now. PICT0005, originally uploaded by Michael A. Lowry. This afternoon Lotta and I went skating on Edsviken. 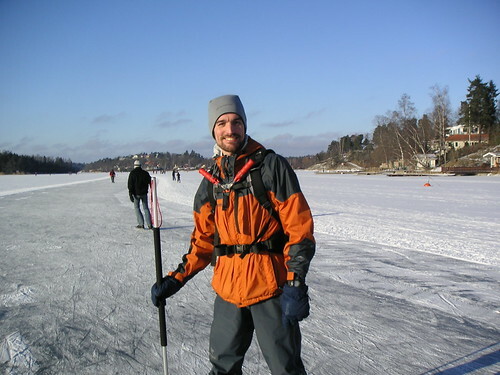 The ice was quite good, and there was no wind. 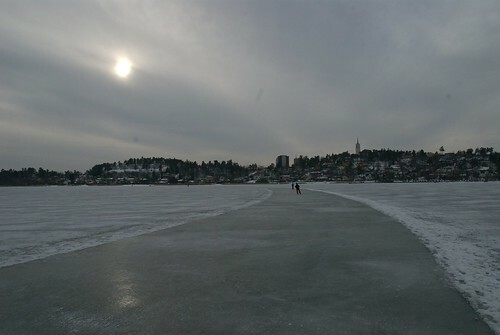 Although it had been overcast this morning, the sun came out after midday and we had a nice skate around the 18-km track plowed in the snow atop the frozen lake surface. By coincidence, I ran into Maria on the way. I met her on the bus to Idre last weekend. She lives on the other side of the water from my neighborhood and was out for a walk on the ice. It's a small world! Lotta had her lovely 7-megapixel Sony camera with her, so I hope to have more photos tomorrow. _MAL7957, originally uploaded by Michael A. Lowry. 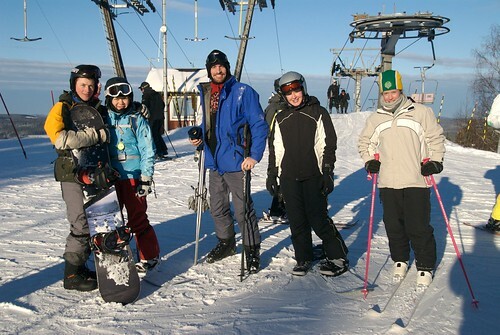 On Saturday, I joined Matt, Lisa, Lotta and Lena for a day trip to Kungsberget for a bit of downhill skiing. 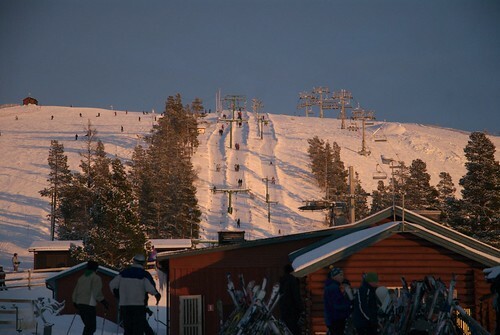 Kungsberget (literally, The King's Mountain) is a small ski resort just 2½ hours away from Stockholm by bus. Click the link for more photos. Today I went to the hospital and picked up a CD containing the data files produced during last week's MRI scan of my knee. Naturally, the CD included a viewer program for Windows but no program for Mac OS X that could open the DICOM medical image files contained on the disk. I performed a search for “DICOM” on MacUpdate.com and quickly found Madena X, a handy program that appears to be made for radiologists and physicians. It not only displays the images; it displays them in the proper arrangement and lets the user navigate through each series graphically. Furthermore, the program shows any other information stored in the files, such as patient name & date of birth, hospital name, date, type of equipment used, and so on. Here is a midsagittal view of my right knee. Here are some photos from the Lindy hop social at Chicago on Wednesday. I have been dancing and climbing a lot lately, but this weekend it's time for something different. 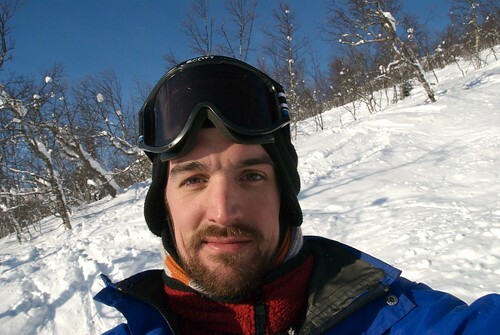 Tonight I'm going to Idre Fjäll for a few days of skiing with Åsa, Patric, and a bunch of their friends. Some of them are folks I met back in September when a group of us went downhill biking at Åre. I haven't been skiing yet this season because of the lack of snow. But now it looks like there's plenty of snow on the mountains, so I'm looking forward to some great skiing. And anyone who knows me knows I love a good sauna; so I'm looking forward to the after-ski almost as much as the skiing. The sun is shining now, and the forecast calls for at least partly sunny skies for the next couple of days. So with any luck, I'll have some nice skiing photos to post here soon!